A roof drain clogged causing the water to rise in the surrounding area. This installation has poor wire management, as shown by a connector sitting loose on a ballast block. Once the water rose and got in the connector, it began to short out (burn marks visible on the ballast block). 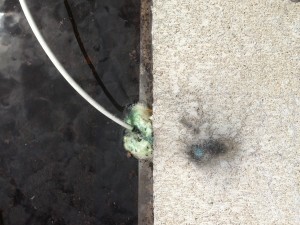 The connector exploded and fell completely the water below where the modules continued to feed short circuit current right into the water, causing more damage and creating an extreme safety hazard for workers. Scary!